Paragon is the leading photocopier supplier in Karachi. We are the best Ricoh photostat machine dealers in Karachi MP 3351. It is a versatile copier, printer, and scanner. The fax mode can be added if needed. It can print documents up to 33 pages-per-minute; first copies in as little as 4.5 seconds. The Ricoh AFICIO MP 3351 can produce up to 100,000 impressions per month. The scan features on the Ricoh AFICIO MP 3351 include scan-to-email/folder/URL. This means you can scan documents in both B&W and color then distribute them at no cost. Moreover, This efficient machine gives you the ability to prioritize print/copy tasks through a job function list. Furthermore, You can move items up or down in your queue so that time-sensitive and important documents can be output immediately. The Ricoh AFICIO MP 3351 includes the solution-based technology that the Personal Paperless Document Manager (PPDM) and App2Me offer. The PPDM provides simple and efficient document management including the ability to transform originals into Microsoft Office documents. The App2Me program is widget-based and gives the users the ability to execute their customized workflow anywhere there is a Ricoh AFICIO MP 3351. Copier Star is the best dealer of Photocopier Machines in Karachi, Pakistan. It has wide range of photocopier brands including desktop photocopier machines, medium size photocopier machines and large size photocopier machines. Copier Star deals in digital advanced photocopier machines including Multiple Function Photocopiers MFP’s. In addition, these MFP’s come with printer, scanner and fax options. Copier Star offers flexible and affordable copier on monthly rent basis for many different applications. Whether you need it for four days or four years, we can work with your needs. You pay month-to-month for as long as you need it. This gives you total flexibility over photocopier machine. If you would like to upgrade photocopier, renting you copier gives you the complete ease and relaxation to help your business grow and flourish without worry. We at Copier Star also provide the facility to Photostat Machine on Rent in Karachi. It has a wide range of customers including manufacturing industries, pharmaceutical companies, offices, schools, hospitals, hotels, and banks. As office equipment goes, a photocopier/printer is a pretty important staple. But as with many things, what works for one business might not be right for another. In fact, lots of businesses make the mistake of buying a large and expensive copier, when in fact their needs are very low or short-term. For many, renting a photocopier, either temporarily or long-term makes far more sense. If you’re short on time, go ahead and call our sale representative to receive tailored quotes that fit your need. On the off chance that you require a copy machine in Karachi, yet your financial plan can’t make space to buy one, or you are disappointed with the execution of your present Photostat machine, So Get Photostat Machine Per Copy Cost Scheme. 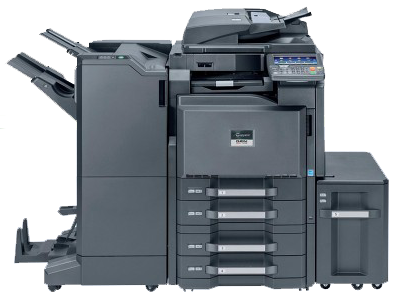 We have the assortment of Copiers of various brands (KYOCERA, RICOH, KONICA MINOLTA and PANASONIC) all in top class condition imported from USA and Europe to fit your copier needs. We will benefit it and supply the parts and toner all with no additional charges.